To reach and influence prospective Cadillac buyers - both repeat buyers and first-time buyers - as never before. To fully utilize technology before, during, and after the events to maximize ROI. To significantly increase sales consideration, opinion, and awareness among participants vs. their pre-event inclinations and to generate sales revenue from participants within six months of the events that was equal to or less than the cost of the events. Six weeks prior to the event, targeted prospects received direct mail invitations sending them to pre-register via the microsites supported and developed by eshots. Each mail piece included a 14-digit code based on the consumer’s demographics, garage history, event data and more. Once registered, guests received a personalized confirmation email, driving them back to the microsite to view video messages from celebrity golf or race instructors thanking them for signing up, further building anticipation for the event. Before and during the event, live content tiles were updated on the microsites based on login ID to include attendee-specific detail such as venue info, agenda, directions, local hotel info and more. 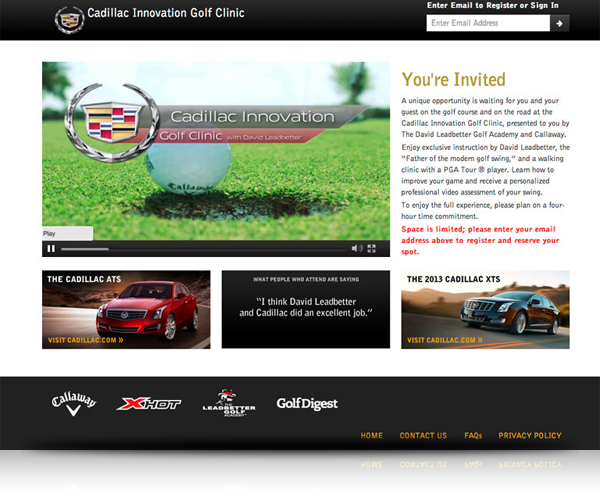 To ensure a Cadillac experience, a new wait-listing process was added for popular sessions. If a spot became available, the invitee was automatically enrolled and informed via email of the change, reducing support calls by 80%. A few days before the events, guests received personalized email reminders confirming event details and driving them back to the microsite where new video messages outlined the agenda. Registrant interactions were measured using Google Analytics to understand which components were garnering the most interaction. After the events, participants were able to download and share one-of-a-kind videos. 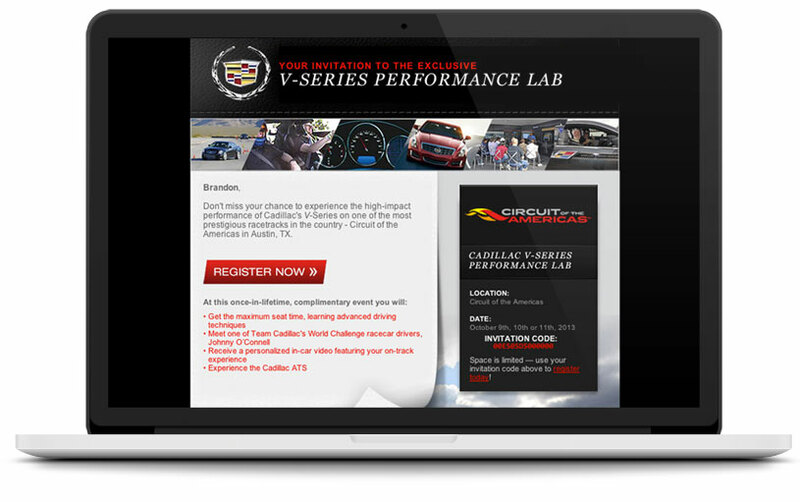 Driving clinic participant videos captured their racetrack experience, including the driver, track, and telemetry (speed, RPMs, acceleration, brake pressure, G-forces, and more). 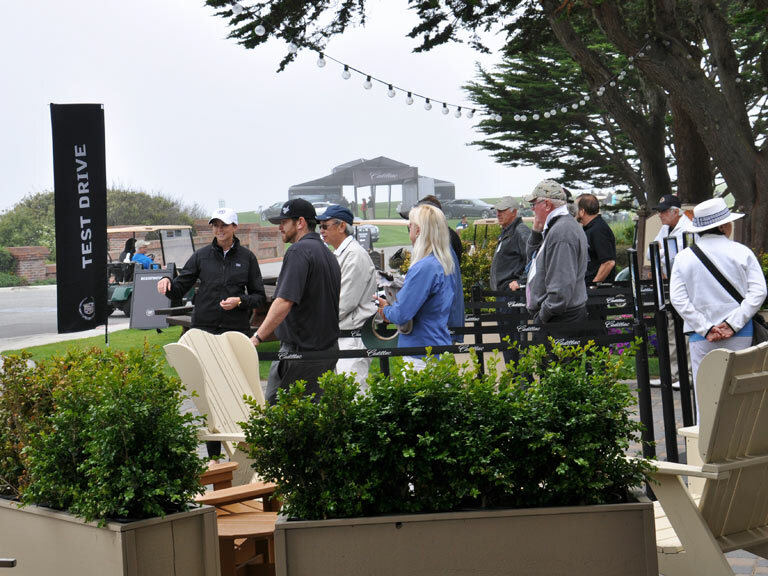 Golf clinic participant videos showed their swing accompanied by a golf professional's analysis and personalized instruction while the culinary clinic posted photos of local celebrity chefs, food and more. At the event, pre-registered attendees (>87%) simply entered their email address, signed a digital waiver, and immediately entered. The process took an average of just 42 seconds, cutting wait times and staffing requirements in half vs. previous events. For individuals not pre-registered, those consumers simply completed an efficient full registration onsite. All participants received a VIP pass and lanyard which was scanned using a mobile phone app to track participation by display, vehicle driven, photo and video participation as well as other onsite activities in real-time. CRM integration: All registrant data was transferred to GM's CRM system nightly which activated dealer follow-up for immediate requests and/or longer-term marketing communications via opt-ins. Participants were then analyzed further to understand propensity to purchase. Those scoring highest were invited to other events to help move them further down the sales funnel, including an all-day luxury driving academy. Data management was the essential factor in driving and measuring success. It all started with a 14-digit participant ID which allowed GM to segment participants, monitor their activity during the event, measure overall opinion and direct interactions with the brand and competitive makes, and follow up with customized calls to action. The eshots experiential analytics platform provided real-time measurement for in-market course corrections, as well as future event adjustments. Templated data analysis enabled GM to easily understand each and every consumer's experience with the brand for micro-targeting purposes. The unique 14-digit code segmented invitees based on a host of factors, including: demographics, garage history, likelihood to be in-market based on past purchase behavior, and more. This code enabled GM and eshots to deliver customized online, at-event, and post-event experiences to different participants, and to track each participant from the point of registration to the point of sale. The narrow targeting and rich experience of the events were a tremendous success. Post event, hundreds of vehicles have been sold resulting in a 1.67-to-1 revenue-to-cost ratio, far exceeding the minimum acceptable goal of a 1-to-1 ratio.